Reviews of software, hardware and everything in-between. Tandy CoCoJust recently I received a package in the mail. It was a flat pack type envelope addressed to me. Perplexed as I had not ordered anything recently, I opened the package. A small book slid out of the packing onto my desk. It took a moment to realize; Oh yes I had asked for a review copy of the new CoCo book. I finished the book this last Monday and I have spent the last 5 days collating my thoughts and opinions before sitting down to write this review here. Due to a hiatus on my podcast, I will be posting a review there as soon as possible, and may have to do a side recording specifically for the book. Read more below. The arcade and pinball machine world is one filled with great individuals with big hearts. Arcade Repair Tips has built a library full of helpful resources for troubleshooting and maintaining arcade machines. They have a strong YouTube presence with helpful videos, a podcast available via iTunes, social media accounts on Twitter and Facebook, AND a phone number to help you get that machine working. In addition to all of this, they have made their videos available for purchase on DVD. These DVD volumes include many of the How To videos from Youtube as well as many extras as exclusives. I recently sat down and watched the Volume 4 DVD and immediately wished I had had something like it when I first started working on arcade machines over a decade ago. This volume jumps into some of the really juicy topics of arcade repair such as troubleshooting games that are playing blind and rejuvenating a CRT’s picture tube. 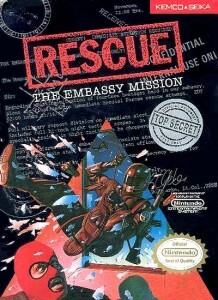 Rescue - The Embassy Mission is one of the most underrated NES games of all time. It's not a Nintendo legend like Mario or Zelda to be truthful, but it's still enjoyable to play. The concept of the game is that terrorists have hijacked the Paris embassy and it's your job to rescue the hostages. This game has a multitude of things to offer as a game and does quite well at performing them. This game is comprised of three major elements: Side-Scrolling, Sniping, and FPS (First Person Shooter). The game is simplistic in its goals and process, but does its job so eloquently. Let's first examine the Side-Scrolling feature. The player picks a character and tries to sneak through a platform to get to the embassy. The player must dodge spot-lights by simply staying out of the way or ducking behind something. This kind of side scrolling is really neat for the time because it lets the game have an interactive background and foreground which gives it a new layer of depth. Once the player reaches a certain point the game will automatically go back to the character selection screen to pick a new character. If the player is caught, however, they will be killed in a barrage of bullets and will have another chance to try with a different character. Open beta so the NDA is lifted (i think?) Played a bit in closed beta and now in open beta. Yet another MMORPG, but based on the AD&D Forgotten Realms books/ruleset made by CRYPTIC who depending on who you ask is hit and miss City of Heroes, Star Trek, Champions. I just stumbled upon this fun little flash game from Mark Foster called Bomberjam. The game is a local two player territory annihilation game which draws upon some Bomberman and Qix gameplay mechanics. In this video I take a look at the Japanese Playstation disc with the game Zanac X which is becoming more rare by the day :( Go check it out. Zanac is a very cool series of Shmup games created by Compile. The game originated on the MSX and NES but also found its way on many other systems like this Playstation One version. It's very similar to other Compile shmups like PowerStrike, Aleste, Super Aleste, M.U.S.H.A. All these games feature a similar weapons system. Other good Compile shmups are Blazing Lazers on the TG16 and Gunnac on the Nes.